Abstract : We evaluate the performance and usability of mouse-based, touch-based, and tangible interaction for manipulating objects in a 3D virtual environment. This comparison is a step toward a better understanding of the limitations and benefits of these existing interaction techniques, with the ultimate goal of facilitating an easy transition between the different 3D data exploration environments. For this purpose we analyze partic-ipants' performance in 3D manipulation using a docking task. We measured completion times, docking accuracy, as well as subjective criteria such as fatigue, workload, and preference. Our results show that the three input modalities provide similar levels of precision but require different completion times. We also discuss our qualitative observations as well as people's preferences and put our findings into context of the application domain of 3D data analysis environments. Many application domains rely on effective, efficient, and intuitive means of interacting with 3D data [37, 48]. Traditionally, this interaction has often relied on mouse and keyboard inputs. Recent developments of interaction technology, however, have led to new input modalities becoming available, in particular tactile input [30, 61, 74] 1 and tangible interaction [31, 59]. 2 Several researchers have thus started to explore their use for interaction with 3D data. Nevertheless, the three input modalities—mouse, touch, and tangibles—are not identical in characteristics such as their capabilities or usability: their advantages and disadvantages depend on the the interaction goal and the given application domain. For example, while one may use a tangible input device intuitively in a game, scientific visualization applications may require a level of accuracy that 1 I. e., interfaces based on finger or pen input on display surfaces. 2 I. e., interfaces that follow Ullmer & Ishii's  four characteristics. one could expect to better be provided by touch-based or in particular mouse-based input. Tangibles are often regarded as the best way to interact with 3D data. We question this assumption here with our study that measured several usability factors: participants' accuracy (i. e., rotational difference and Euclidean distance), their perceived fatigue levels, and their perceived workload. We also took into account participants' preferences and their general feedback for each technique. The study consisted of 15 abstract 3D docking tasks—bringing an abstract virtual object to a given target orientation and position—for each of the three modalities. 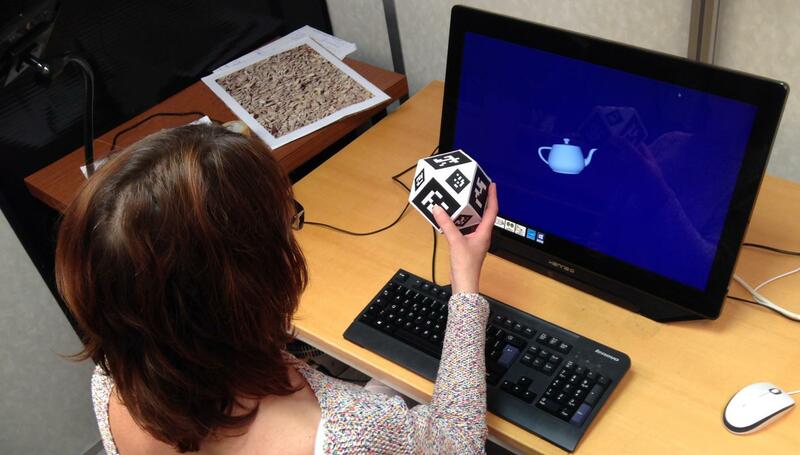 Our study confirmed that mouse, tactile, and tangible input are all valid means to control 3D manipulations. Much to our surprise, however, we found that all three input modalities allow users to achieve the same level of accuracy. Differences only arose with respect to task completion times and preferences. Qualitative observations of the participants during the study provided additional insights on what users tend to do when facing a docking task with these three input techniques which we discuss in detail below. In summary, we contribute (1) an in-depth analysis of people's understanding and use of mouse-based, tactile, and tangible input for 3D interaction, (2) a study design that compares the three modalities, and (3) in-depth qualitative observations and people's preferences in the context of 3D data analysis environments. We thus shed light on the advantages and disadvantages of the techniques and serves as a basis for their further development and evaluation, in particular for 3D visualization.